So many things to get done so we can get back on the road! Luckily, we have some great friends in Phoenix that were willing to let us get shipments there so we could get it all set up. We ordered all the things, and once we knew the shipping schedule we made the necessary appointments and started planning. Also, fair warning! Lots of these photos show a very dirty brand new truck. Because we basically live in the desert off unpaved roads. It'll be ok, I promise :). We knew we needed some sort of bed liner so as not to scratch up the bed or have things sliding around back there. We went back and forth on a drop-in versus a spray liner. We even visited a couple places in town to see if we thought the spray liner would be worth the investment. 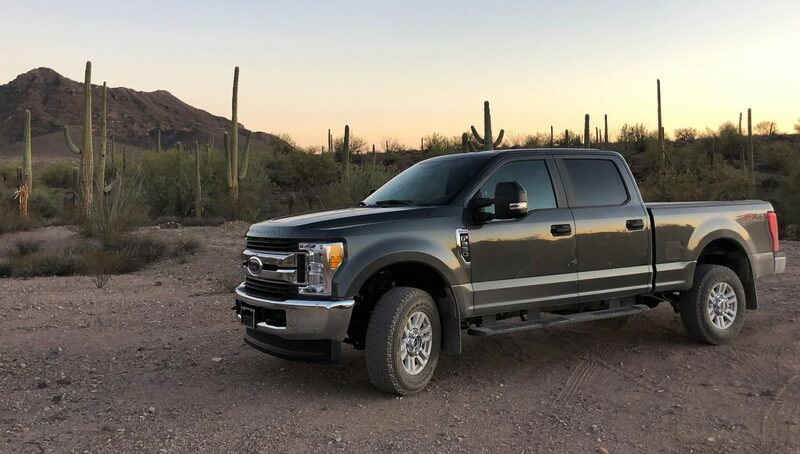 The 2017 Super Duty has a new body style that wasn't compatible with the tons of drop-in options out there. So it helped us narrow down our choice to a spray-in liner. We were very impressed with Inyati. They talked us through the whole process and let us know it would take about 2 hours. They really know what they are doing. There were no traces of overspray on the truck (which is what I was afraid of). I love the look of the spray liner and I think it will be a really good investment. We let the bed dry for the full 24 hours then loaded up all of our belongings in the back of the truck and pulled the Airstream to our friend’s house where we planned to put on the mud flaps, Retrax cover, and get the new hitch figured out. Thankfully, their neighbors didn’t mind us parking in front of their home for a couple of nights! On our last truck we had with a Retrax OneMX bed cover and were so pleased with it we decided to get another one. It's easy to open and close and locks tight in any position. Since we had installed the last one, we knew we could do it again. We were so excited to get started when we got there, we quickly unloaded the back of the truck and got out the Retrax box. But…we quickly realized that we only got half of our shipment from Tonneau Covers World and of course, it’s Friday evening and they’re now closed. Missing the main rail system, we quickly called Truck Accessories Plus in town to see if they had the parts in stock that we were missing. But…they’re closed, too! Luckily they were open on Saturday so we called first thing in the morning and they had the parts we needed! Plus, Tonneau Covers World was willing to refund us for the parts we didn’t get in the first shipment so it all worked out in the end. Since the shop was a good 40 minutes away, we just let them install the whole thing for us. They did it much faster than we would have and it only cost us like $100. Had we bought the whole Retrax from them it would have been free, but hey, it’s one less thing that we had to do, so…thank you, Truck Accessories Plus! In order to attach them to the aluminum body and not cause corrosion an elaborate bracket system was needed. Plus the flaps themselves didn’t have predrilled holes so we had to be really careful we didn’t screw them up. Luckily, Jonathan and Juan are both perfectionists and got them on and man, they look good. The carpet mats that came with the truck just weren't going to fly. We're constantly in dirty, dusty, muddy conditions since we boondock so much - and rough, rubberized mats were exactly what we needed. We negotiated those during the truck purchase so it was just a matter of picking them up at the dealership and setting them in place. Ah, much better! Next we just had to figure out this hitch. Since our weight distribution system is the original one (read: 46 years old Reese) it can be hard to find a head and shank that will work with the distribution bars. Thankfully, ETrailer has saved us not once, but twice! We called them up and they helped research a new shank that had enough drop, but would still work with existing head and distribution system. This 5.75" drop shank is a beast. But it's longer so that meant new chains, new hooks and more work. Thankfully Juan had all the right tools to get the job done right. The Airstream is finally level when we're towing which means less bottoming out at the back end. Though we traded that off with a little less clearance on the hitch side. But overall we're really happy with it, and as always, ETrailer was awesome to work with. If you ever have any questions or concerns about what product you should get, they have so many great instruction videos and tutorials, you should really check them out before you make a decision on anything trailer/RV related. It was a crazy couple of days dealing with getting the truck ready but we were so thankful to have these great friends in Phoenix that are always willing to help us get things done. Michelle and Juan, we can't thank you enough. Now, get that bus done and come travel with us! And now...back to our regularly scheduled travel!